Thanks to the Heroes of the Railway, we can travel safely and conveniently on the tracks of KTMB. We hardly think of these behind-the-scenes people who make it possible. Rotary's Pride of Workmanship Award is given to those who provide excellent service to their fellow men by their vocation. Rotary in Malaysia, in Districts 3300 and 3310, take the initiative to honour these men and women who make our railway travel so smooth that we don't even think about them. 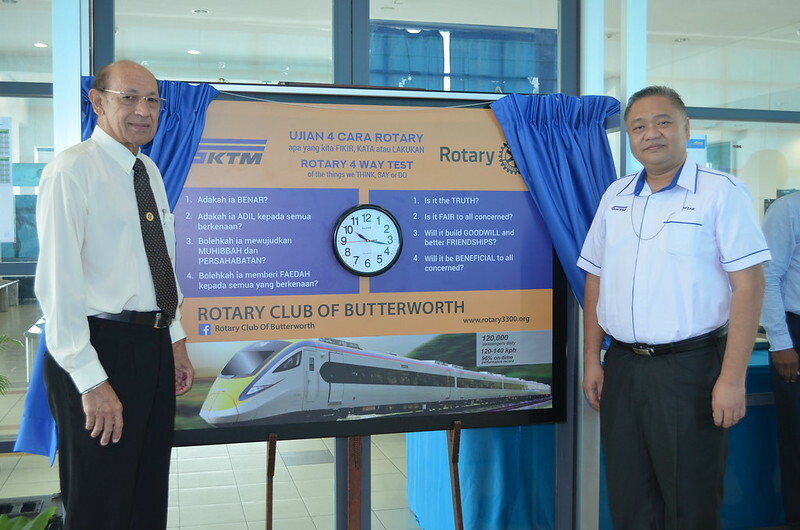 Rotary Club of Bandar Sungai Petani honours Mohamad Afi Bazli from the Tunnel and Swing Bridge Department of KTMB. He is based in Taiping. A plaque commemorating the award will be put up at Sungai Petani Station. It promotes a way of thinking, speaking and behaving that is acceptable to all, regardless of race or religion. The "4-Way Test" of Rotary is universal.